The versatility of the basic ingredients in lasagna complement so many other flavors that cooks prepare many varieties of the layered and baked dish. While cottage cheese often gets used in place of, or in addition to, ricotta cheese in a lasagna filling, omitting it doesn't detract from the flavor. Even if you're cooking a lasagna without any dairy products there remain nontraditional versions using dairy substitutes that still prove easy and satisfying. A traditionally-made lasagna uses ricotta, parmesan and mozzarella instead of cottage cheese. To quickly add extra flavor to lasagna, cook ground beef and sausage with garlic, then add tomato sauce, oregano, parsley and basil. Spread a cup of the meat sauce in a lasagna pan and put down a layer of noodles. Top with ricotta and parmesan cheese -- you don't have to use cottage cheese -- and another cup of sauce. Repeat the layers and top the dish with grated mozzarella. A vegetarian lasagna proves as simple as preparing a traditional lasagna without adding meat to the tomato sauce. You can still use ricotta, parmesan and mozzarella cheese in place of cottage cheese, but for a different flavor profile, use cream cheese and asiago cheese in the filling and top with grated extra sharp white cheddar cheese. Add more protein and texture by draining extra firm tofu of excess water and crumbling into the tomato sauce before layering the lasagna. Meat substitutes, such as soy-based sausage products, also work well. For a vegan lasagna that uses no meat or dairy products, use vegan cream cheese as a substitute for cottage cheese. Soy-based meat products or tofu add texture to the sauce. 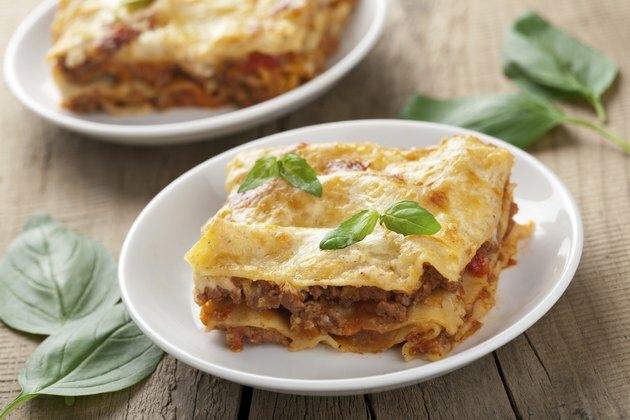 Top with a soy-based cheese and you will end up with a lasagna that closely resembles a traditional lasagna. Add loads of fresh vegetables -- such as zucchini, yellow squash, spinach, mushrooms and bell peppers -- for extra color, flavor and texture in a nontraditional lasagna. Toss vegan breadcrumbs with a little olive oil to top the dish and finish under the broiler. For a really fast and easy lasagna, use noodles that do not require boiling. Layer the noodles like regular noodles in the dish but the sauce and baking process softens and cooks them. For extra texture in a lasagna prepared without any cheese, use a chunky tomato sauce. Set some of the sauce aside before cooking and drizzle over lasagna just before serving. Sprinkle with chopped, fresh parsley for extra kick.